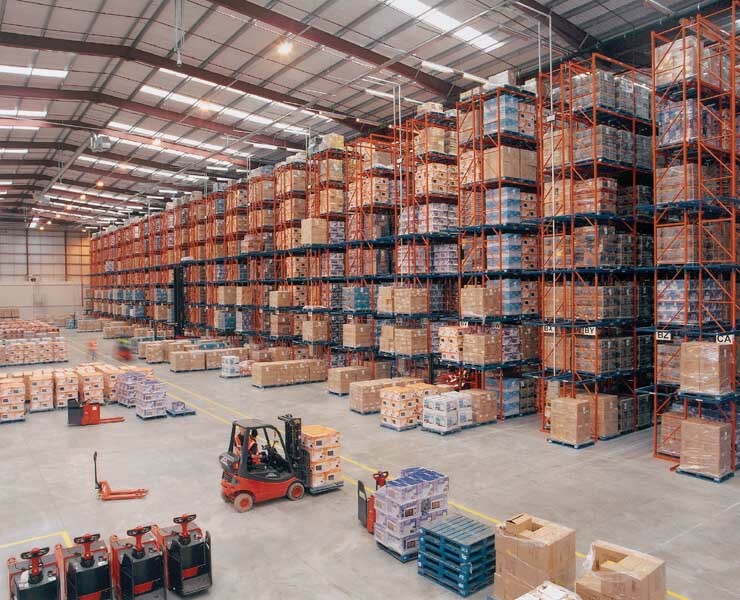 Alba plc’s new state of the art 8 million pound distribution centre opened for business on July 29th 2003. Without our involvement, however, things could have been very different. Having initially lost the contract, we were delighted to be given a second chance when the original racking supplier went into receivership and could not, therefore, fulfill the contract. Alba is one of Europe’s leading suppliers of electrical consumer goods. It’s brands include Bush, Goodmans, Hinari, JCB power tools and Roadstar. Through the acquisition and development of well known brands, it is developing a position as a key supplier to major retailers across the continent. Turnover of £525 million in the last financial year is proof of the company’s success. The new Cortonwood distribution centre was built to improve the group’s support infrastructure and to bring more of its logistics capability in-house, reducing its dependence on third party storage companies. Selected for its strategic location between Alba’s two existing distribution centres, Cortonwood is on the outskirts of Barnsley equidistant from the M1 motorway and A1 trunk road. It is also close to several of Alba’s major customers. Within the purpose built, 140,000 square foot building, office space is deliberately kept small. 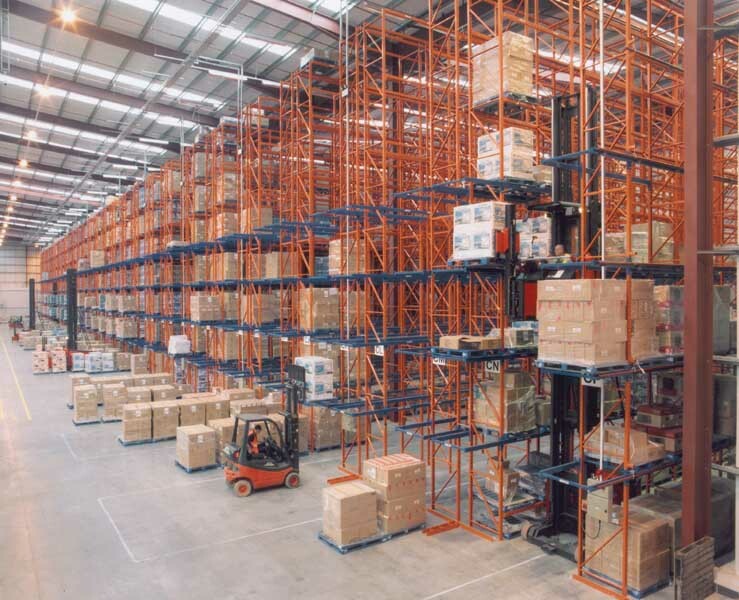 VNA racking systems normally have aisles around 1.5 – 1.6 metres wide. This frees up to 45% of the floor space given over to aisles in a wide aisle scheme. The net result is a dramatic increase in space utilisation. 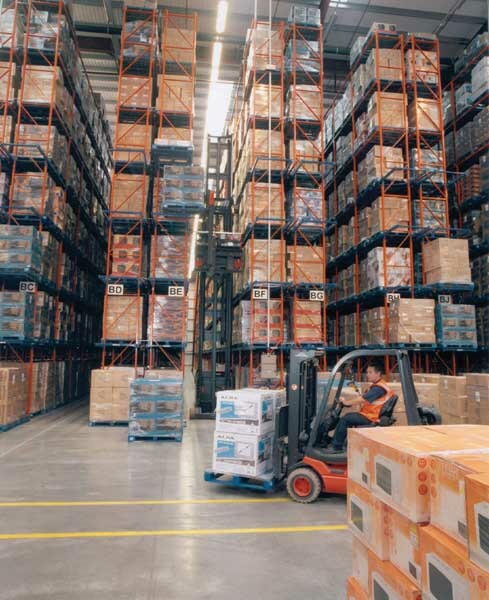 Each pallet is supported which means that stock rotation and accessibility are as good as a wide aisle system. 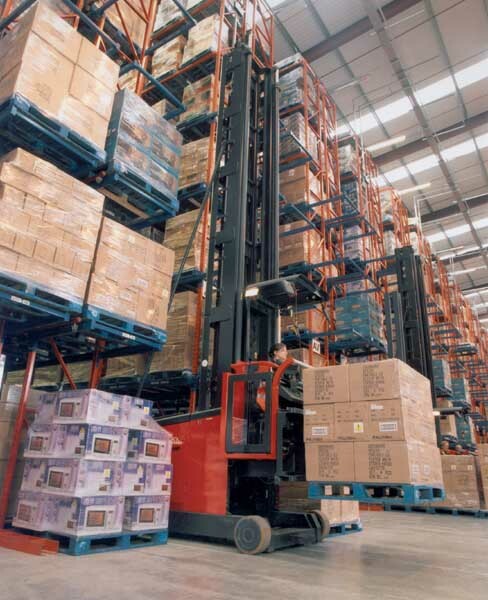 At Cortonwood, the racking rises to over fourteen metres in height and is serviced by man up pallet stackers. There are sixty-two runs of racking, each with eight beam levels. The majority are twenty eight bays, or 71.5 metres, long. The trucks are wire guided, a good solution for guiding lift trucks at optimum speeds through narrow aisles. It steers the truck automatically, allowing the operator to concentrate on the next pick. Its use can also increase capacity by eliminating the bottom load beams and aisle-entry devices, that reduce storage space on ground levels with rail guided systems. Half height P&D stations are located at the end of each run of racking, where pallets for putting away or shipping out are marshalled using standard fork lift trucks. At Cortonwood some 3000 pallet movements take place every day. Not surprisingly, in such a vast site a sophisticated warehouse management system controls stock location, storage and retrieval. Products are received from Alba’s manufacturing plants worldwide in containers. The items are unpacked, palletised and put away in the racking. In the main, product is shipped out as full pallet loads into Alba’s customers’ own distribution networks. There is, however, a considerable amount of customisation that takes place before items are despatched. It is the control of this critical process, the ability to present products to their customers as they want to receive them, that has driven Alba down the self managed warehousing route.